Ardipithecus ramidus, a four million year old ancestor of humans, was so important that it was declared the biggest scientific breakthrough of 2009. That might still be true - but we might also be totally wrong about where it lived. A central argument that spun out of the discovery in Ethiopia of Ardipithecus ramidus was that it lived in a dense, wooded canopy with a cooler, less humid climate than what now exists there now. This meant that the fossil potentially overturned the longstanding savanna hypothesis, which holds human ancestors were forced by encroaching grasslands to leave the trees and forage for food on the ground. 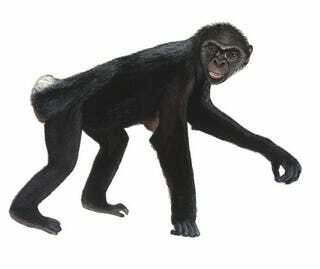 Now, a paper cowritten by four anthropologists and four geologists have challenged this assertion, noting that analysis of ancient soil and animal fossils found in the same region actually shows Ardipithecus lived in an area that was only 5 to 25 percent wooded, which is far, far below the minimum 60% forestation for something to be considered woodland. The researchers admit there's a slight possibility that this particular specimen lived in a tiny wooded strip along a river, but that river was still very much situated in a savanna, not a forest. Brown: "The idea that savannas were important in human ancestors starting to walk on two legs means they spent less energy getting from one food source to another than they would have if they were still moving around on all fours. One of the big, newsworthy items that White and coworkers put forward is that Ardipithecus walked upright on two legs, yet lived in a forested environment. They then say the savanna hypothesis – which holds that the reduction in forest cover in Africa is one of the reasons for early man becoming bipedal – must be incorrect." Cerling: "Our conclusion is that much of the evidence that they present should be interpreted as a savanna environment, therefore their rejection of the savanna hypothesis is incorrect." Brown and Cerling stress they're not actually advocating for the savanna hypothesis. Rather, they're simply pointing out that if other researchers do want to challenge that idea and argue Ardipithecus lived in the woods, the data that exists currently is not a good place to start.